That's actually surprising about Kashi, a great observation on their part... at least it's a better type of sweetener than the ones that you can't pronounce. We have a store called Farm Boy here and it sounds a lot like Whole Foods. I generally try to eat un-processed foods myself but when I slack processed foods sneak their way into my diet, and my body really feels the difference! Those sneaky things they do make me so mad. Like packaging a small cookie and calling it 2 servings. Unnecessary trickery. The biggest label shock I've had was with pop tarts. Obviously they're bad - duh - but I was not prepared for something like 70+ grams of carbs. That's like all sugar. Yikes. I read the labels on everything. It makes me sick when I think of the crap I used to eat! I'm still not perfect when it comes to making choices but without a doubt I've made huge progress. OMG, I learned something today and am sooooooo happy!!! 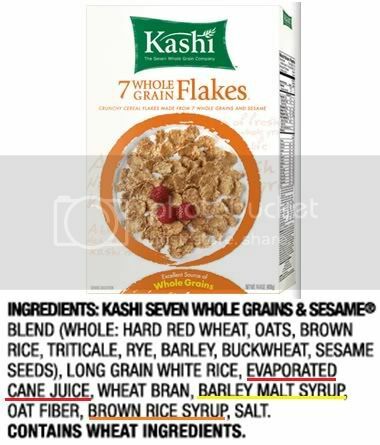 Thanks for sharing the info about the ingredients list for Kashi cereal!! Whoa!!! I didn't know the trick they do to individualize the ingredients so they can put it at the end and make you think there is "less" of it in there. I feel so exhuberated right now!!!! Thank you thank you thank you!!! I buy so many Kashi products, but will be looking at every single teeny tiny ingredient listed now....thanks to YOU!!! I DO read labels on everything I buy, I will not eat anything that is not whole. Thanks so much for sharing this info, I'll definitely be looking more thoroughly now! Before I did my veggie for a month challenge, I didn't read a single label but since then I tend to check them more often.